Everyone you ask has a differing version of where and when this custom began. 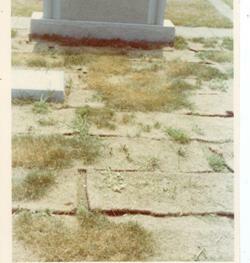 I do know that when I began in the field of Cemetery care in the mid 1960's, visitation stones were a rare sight. Today you see them everywhere, even in non-Jewish cemeteries. it is a nice feeling to leave a memento on the grave of a Loved One, and it makes it easier to see how many people are remembering and visiting someone. On the other hand, it is important to remember that LARGE stones can cause a serious danger to passersby. If they fall off the monument into the grass and are hit by the blades of a lawnmower, they will be propelled across the cemetery with the velocity and force of a bullet and could seriously injure or even KILL a passing visitor or the personnel working in the area. We have placed a box of Visitation Stones at the entrace to each cemetery in our care, to make it easier for visitors, and to supply stones of an appropriate size. We hope you will avail yourselves of this service, or if you wish to bring a special stone, be sure it is of a size smaller than one inch to avoid danger to others in the cemetery. It is imperative that we contain this invasive species before it causes the total destruction of the trees in our area. Please never place glass items on the cemetery. this tumbler full of glass beads was discovered in the grass beside a marker. If it had been hit by a mower before I found it, it could easily have resulted in the loss of an eye or other severe injuries to the cemetery personnel or a visitor. Please help us keep the cemeteries a safe place for all to enjoy. Do not attempt to make gardening improvements without consulting with the Cemetery office first. We can perform landscaping that is appropriate to your lot. Attempting to do the work yourself, can lead to disastrous results, and more costs to rectify the results, than if you had hired us to do the work in the first place. The photo on the left is the result of a family over-fertilizing their lot. That bag of lawn fertilize you purchased at the Garden Center is supposed to cover a quarter acre or more: one handful is too much for a 24 square foot grave. It will actually kill the grass, as you can see in the photo, and will poison the soil just like you poured salt on it, so nothing will grow for several years, unless we dig the topsoil out 6 inches deep and re-loam and seed. The photo on the right is what happened when a family decided to dig out their family lot and sod it, probably at great expense. The problem is that sod needs a LOT of water, especially in the heat of summer, to survive, and most cemeteries do NOT have sprinklers. Even in those cemeteries that do, sod needs to be watered several times a day to prevent the drying out you see in the photo. we had to remove all the dead sod, re-loam and reseed the lot, at additional expense to the family. Dave McKenna has been caretaking Jewish cemeteries for 45 years. Dave McKenna with his modern mower and his grandfather John’s scythe. DANVERS — For 45 years, Dave McKenna has been burying North Shore Jews and caring for their graves. McKenna, who is half Italian and half Irish, takes great pride in his occupation. He is president of John M. Ross and Son, Inc., a family-owned business launched by his grandfather. “In July of 1929, a Jewish man named Zusel Sushelsky died in Salem. The man who normally dug graves at the Sons of Jacob Cemetery was not available. They asked my grandfather, John Ross, a farmer, to do it,” McKenna said. “It was the Depres­sion, and they paid him $20 for the task. He realized he could make better money digging graves than planting carrots,” added McKenna. Telephones were a rare commodity in those days. Ross didn’t have one, but a lady who lived a quarter-mile away on Route 114 did. When a temple or funeral director needed his services, they would phone her, and she would hang a red blanket on her porch as a signal for him to come over and get the information about the interment. Ross steadily grew his business with the help of his son, Edward. He realized that his 50 acres of farmland on the Danvers/Middleton line were attractive to temples, which could locate their cemeteries on it. Parcel by parcel he sold the land, negotiating contracts with the buyers to handle the burials and manage the properties. McKenna joined the business at age 15. Today he handles the day-to-day operations of 21 Jewish cemeteries on the North Shore, most of which are located in Peabody, Danvers and Lynn. The 59-year-old estimates that he has personally overseen the burial of 10,000 local residents. “Now I know why my back hurts,” joked McKenna, who in the early days dug the graves by hand with a pick and shovel. Today, he and his crew use backhoes to break up the rocky soil. Sophisticated equipment has eased the burden of cemetery maintenance. His grandfather used to cut the grass with a scythe once a year, prior to the High Holidays. McKenna keeps the old fashioned tool as a memento, but uses modern machinery to handle the routine tasks, which include the lawn mowing and trimming of shrubs, and the loaming and re-seeding of collapsed graves in the older cemeteries. Winter offers distinct challenges to cemetery caretakers. Mountains of snow must be cleared from roads, and jackhammers are necessary to open up frozen gravesites. McKenna is proud of the fact that even during the infamous Blizzard of 1978, he was able to keep operations running smoothly. Over the years, McKenna has seen many changes in Jewish funeral practices. “When I first started, burials always took place the next day. This custom originated when Jews lived in the hot desert, and people had to be buried quickly for obvious reasons. It became a tradition. Although we still sometimes get calls for next-day burials from very Orthodox families, it is rare. People don’t live in the same neighborhood anymore, and kids have to come in from California and Ohio. Getting the family together takes several days,” he said. He also notes the growth of interfaith sections in cemeteries. “Ten years ago, we didn’t have any. Now six of our cemeteries have them, and others are talking about it,” said McKenna, adding that Orthodox and Conservative cemeteries require that their interfaith section be separated by a hedge, fence or roadway. McKenna, whose wife and son are both Jewish, is very knowledgeable about Jewish customs. “It’s a Jewish obligation to visit the graves of your ancestors on the High Holidays. Years ago during the four Sundays of Elul [when it is traditional to visit the cemetery] we had to have three cops directing traffic. Now on a Sunday in Elul, we might get 12 cars. Young people don’t come to visit like they used to,” he laments. McKenna has picked up some Hebrew, which he puts to use when need be. “One of the saddest things to me is a direct burial,” said McKenna in describing a funeral no one attends, not even a rabbi. “Maybe the person was very old, or not well liked. The family might live far away, or can’t be bothered. But I find it very upsetting to just bury the person with no ceremony. I will say Kaddish, not very well, but I can say it, in order to see this person on their way,” he said. McKenna, who holds a degree from Stockbridge School of Agriculture at U-Mass, computerized the business’s record keeping system in 1989 with help from his mother, Eleanor Ross. He currently has 30,000 cross-referenced data entries, including detailed information on 20,000 burials. In an instant, he can retrieve information on a deceased person’s date of death, next of kin, who made their monument, and whether the individual was a veteran. He can also pinpoint exactly where the person is buried, and print out an accurate map for the family interested in visiting the grave. The careful records make McKenna a valuable source for those seeking Jewish genealogical information. The avid historian is an active member of the Danvers Historical Society and the Massachusetts Archeological Society. A former selectman, McKenna founded the Danvers Diversity Committee 20 years ago. While anti-Semites have targeted some Jewish cemeteries, McKenna is happy to report that no major vandalism has occurred in the cemeteries he oversees. Although some might find the work macabre, McKenna says he enjoys his job, for the most part. “Burying Gery Posner (former publisher of the Jewish Journal) was not a day I enjoyed. But we are a service organization. People come to us in their darkest moments, and we help ease the journey for them,” he said. While some might view the burial business as recession-proof, McKenna admits that the economy has affected him. “We are seeing more cremations,” McKenna said. Although Jewish tradition generally frowns upon the practice of cremation, a growing number are choosing that option and occasionally asking McKenna to inter the cremains in a burial plot. “That can save people a lot of money,” said McKenna, pointing out that it runs a quarter of the cost of a full burial. An added benefit is that the family can mark the site with a monument or plaque, which can’t be done if the cremains are scattered at sea. They will also always have a place to come visit their loved one. To expand the business during lean times, McKenna has branched out into the cleaning of monuments. “For some reason, moss and lichen are growing on the old stones. Maybe it is a result of global warming, but the fact is, you can’t even read some of the old stones anymore,” he said. The company can clean aging granite and marble stones, and refinish, polish and reseal bronze ground markers that have turned green. They also have a special epoxy that can repair broken monuments. McKenna, who has worked in this business his entire life, would love to groom his son as a successor. The youth, however, is not interested. “I’m looking for someone to take over when I retire. I’ve cared for these graves for almost 45 years, and can’t just walk away. It’s been my life,” McKenna said. 2011, THE WINTER HELL FROZE OVER Maybe not quite, but with over seven feet of snowfall over a five week period, it certainly looked like it had. By the first week of February, there was three and a half feet of snow accumulated in the cemeteries, and in many places the monuments were not even visible. And yet we were still able to keep the cemeteries open at all times,through the heroic efforts of our dedicated staff. Roads which had shrunk down to one lane due to the accumulation of snow were widened several times with front-end loaders to keep them passable for visitors, and walkways were kept open with snowblowers so visitors could walk into the cemeteries. Burials continue to be made in a timely fashion, with snow cleared to gravesites, and sand or mats spread to provide safe access for mourners. Our cemeteries have remained open despite rumors and news reports that Jewish cemeteries may be closed, or not making burials. We continue to make every effort to ensure that our Families' needs are met when they come to us in their darkest hour, and that the interment of the deceased can take place in a safe and dignified manner. And while snow may be piled on graves near roads due to the huge amounts we are dealing with, we try to remove larger piles as we can find time between storms and burials.